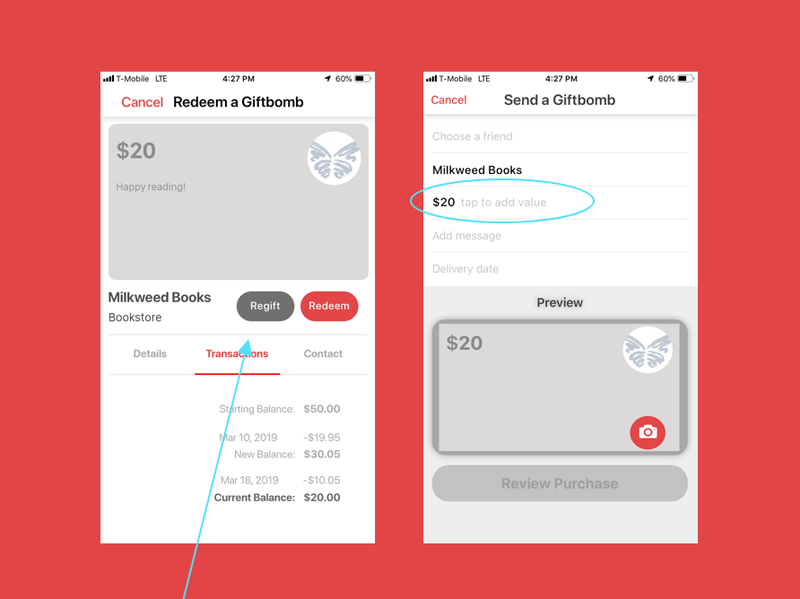 Giftbomb is a mobile gift card app that lets users easily search for and purchase digital gift cards, and send them to friends and family. Giftbomb came to my team for help designing new features that would increase user engagement and sense of emotional connection. With Giftbomb’s goals and values in mind, my team worked to research and rapid-prototype a set of new feature concepts. From there, I created high fidelity wireframes and a functional prototype with Axure. Collaborated with 3 other UX professionals to create a competitive audit and synthesize user survey data using the Kano Model. Early in the process, after an initial client meeting and personal tests of the app, I created a Journey Map to visualize opportunities for improvement from the perspective of both sender and recipient. For a new company without much brand recognition, it’s especially important that Giftbomb engage its users with an experience that feels personal and trustworthy. When the recipient isn’t familiar with Giftbomb, the notification process can feel impersonal or even suspicious. Two of my proposed features aim to address this problem. 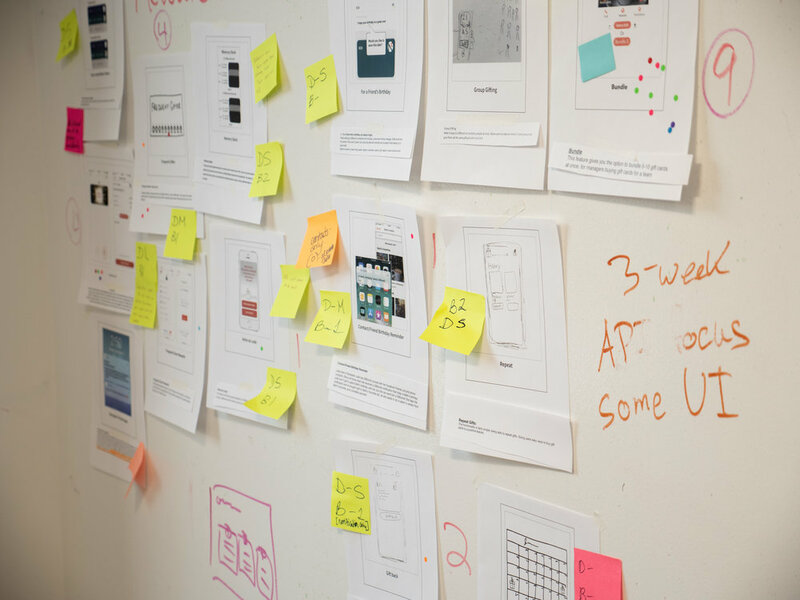 After brainstorming and wire-framing dozens of possible features, my team met with the business and development teams to scope timelines and business priorities for each feature. To decide which concepts would ultimately move forward, we surveyed a set of typical users on 10 potential features. I collaborated with two other members of the team to conduct a Kano Analysis of user survey results provided by the client. 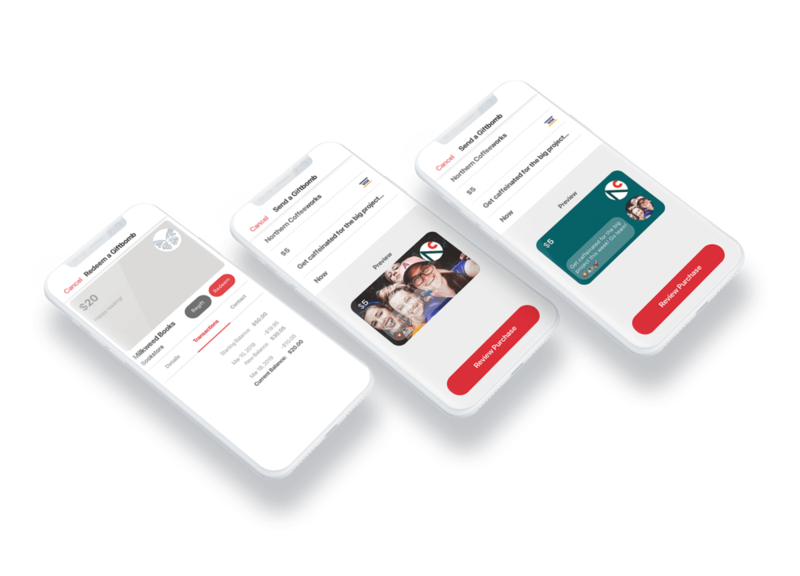 Given our development timeline of 6-8 weeks, I wanted to design features that were light on engineering and high on user value, helping this growing company to increase engagement with new users and existing users alike. 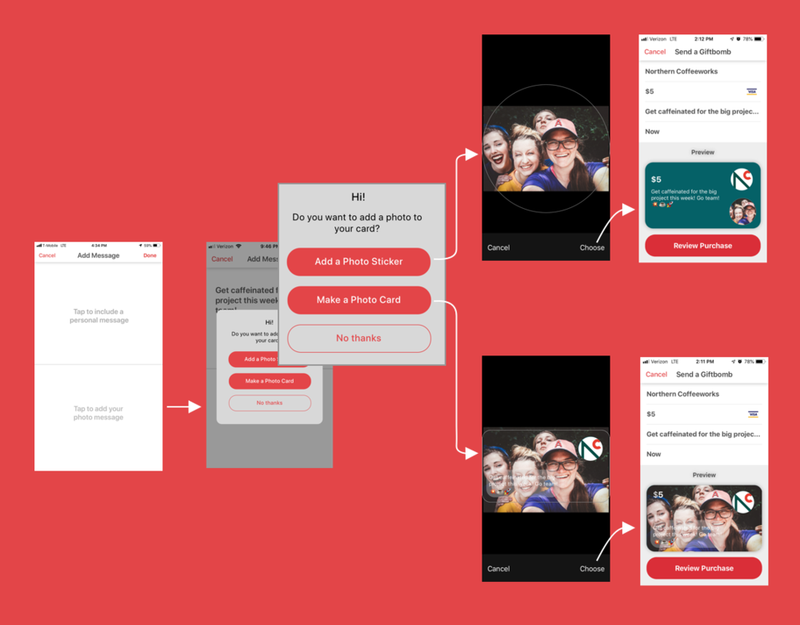 In response to research results, I contributed high fidelity wireframes of 4 new features, all focused on inspiring new forms of engagement and deepening users’ emotional connection to the gifting process. Leveraging what the app already did well and using the existing UI as a model, my new features focused on expanded gifting functionality and personalization. To help the client visualize two of the new features, I created a functional prototype using Axure. My first 2 proposed features aim to inspire more frequent interaction by making gift giving fun and flexible. These features scored high in our user survey, and had high business potential as well. Send the same gift to as many friends as you want, simultaneously. Pass along an unwanted gift to someone who would appreciate it more. Gift giving should help people feel more connected to each other. By extension, this emotional response should connect to the Giftbomb brand as well. I prototyped two more features that let users personalize their experience. Above, the opportunity to customize a gift card with a personal photo. Lastly, a personalization feature that appealed to users on both a practical and emotional level. The personalized text message served the emotional connection between sender and recipient, and increased users’ perceived trustworthiness of the brand.